Whether your skin is naturally dry, irritated, oily, acne-prone, combination or sensitive, we can help you achieve the healthy, glowing skin you desire. Our esthetician uses only the highest-quality skincare products and ingredients in our facials and other skincare treatments. She can customize a treatment to suit your skin’s specific needs as well as make recommendations for your daily skincare routine. The end result will be beautiful skin that you love. Great for all skin types, this customized facial consists of a custom treatment mask, extractions and a variety of cleansers that reach deep down into the pores to absorb and remove dirt, oil and toxins. The use of exfoliators further complements the treatment by removing dead skin cells. A massage of the face, neck and shoulder is included. Much like the deep pore cleansing facial, the European facial includes a thorough cleansing, exfoliation, extractions, an individualized treatment mask and massage of the face, neck and shoulders. How it differs, though, is that a deep pore cleansing facial focuses more on extractions, making it great for those with acne-prone or oily skin. 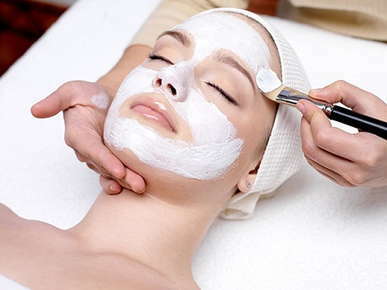 A European facial, on the other hand, places greater attention on exfoliation, for smoother, softer skin. For those with acne and blemishes from previous breakouts, this facial is designed for you. It specifically works to calm acne and improve the appearance of blemishes by using products that rid dead skin and help manage acne-causing bacteria. The skin is thoroughly washed and exfoliated, and then extractions are performed before an acne treatment mask is applied. This facial is for those with dry skin. It includes the use of hydrating cleansers before exfoliation and extractions are performed. Then, a hydrating mask and rich moisturizers are applied that will keep the skin hydrated long after the treatment is over. This treatment can be performed along with your chosen or customized facial. Microdermabrasion involves the use of small abrasive crystals and a suctioning action, to lightly strip away the outer layer of skin, leaving it polished and smooth. When microdermabrasion is performed in a series, clients can expect: their skin texture to improve; wrinkles and fine lines to soften; hyperpigmentation to improve; and acne scars to become less visible. This exfoliation treatment uses enzymes from natural pumpkin to improve the skin’s texture and firmness, no matter the type of skin. It specifically works by exfoliating and injecting vitamins and nutrients, such as beta carotene and vitamin A, into the skin—all of which improves circulation and fosters healing. A series of pumpkin peels spread out over several months is recommended for best results. Glycolic acid peels complement any facial and are best for those with acne, blemishes, textural problems and/or oily skin. Consisting of glycolic acid, this peel is designed to minimize oil, improve skin texture, tighten pores, improve fine lines, treat acne and acne blemishes and promote a radiant complexion. Accompanying any facial, this treatment is designed to minimize fine lines, hydrate and brighten the eye area while reducing puffiness.